Lettuce bolting in the hot weather. It’s that time of year – the days are long, the weather is hot, the dog days of summer are upon us. 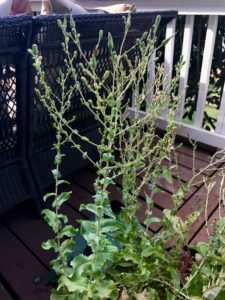 If you are growing lettuce in your garden, you might notice the flavor turning bitter and see the plants start to shoot up towards the sky. Don’t pull your lettuce plants out yet, save some seeds! It only takes a few minutes – in fact, it’s so simple, if you’ve never done it, you’ll wonder why not. Once you start, you’ll do it every year, and will love have free seeds for the next time you plant. Lettuce loves cool weather. (Tips for growing lettuce in hot weather will be shared in a blog post very soon – stay tuned! ) Once temperatures climb above 75-80 degrees, lettuce doesn’t like it. It starts to grow tall stalks (called bolting), develops flower heads, and eventually produces seed. 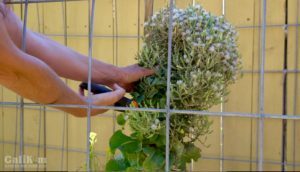 Allow the flowers to completely dry out so you can save seeds from lettuce plants. One lettuce plant can produce hundreds, if not thousands of seeds – you only need a few plants to save lots of free seeds. Once your lettuce bolts, leave a few plants in your garden bed, allow the flowers to bloom, then dry out completely on the stalk. Depending on the weather, this could take a few weeks to a few months. Once your lettuce heads are completely dry and fluffy, the seeds are ready to harvest. 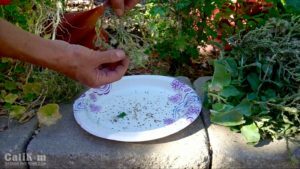 Using a paper plate is a quick and easy way to save lettuce seeds. 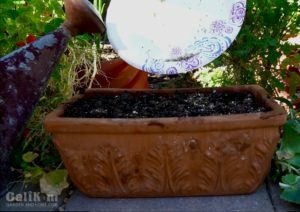 If you just have a few lettuce heads to save seeds from, the paper plate method is for you. Clip off your lettuce head from the stalk, and rub the dry flower heads between your fingers over a paper plate. The seeds will pop right out and fall onto the paper plate. Voila! You now have FREE seeds! Clip the seed head off and save those seeds! Save your seeds for later, or plant them immediately in an empty spot in your garden or in a container. Growing lettuce in a container allows you to move it into the shade when the weather is hot, making it easier for you to grow lettuce all summer long! Plant your seeds right away or save for later. Shaking the seed head in a paper bag works like a charm for saving seeds. 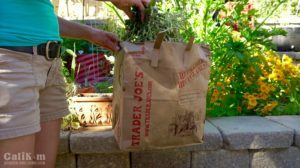 If you have an entire garden of bolted lettuce to save, the paper bag method is for you. Clip your lettuce head from the stalk and place the entire head in a paper bag. Fold over the top of the bag and shake vigorously for 30 seconds or so. The seeds will fall right out into the paper bag. Open the bag, check the seed head to see if most of the seeds have fallen out. If not, close the paper bag up and shake some more. 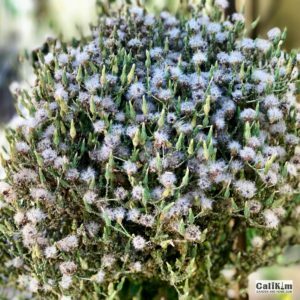 More FREE seeds! To separate seeds and chaff, shake in a wire mesh strainer. When you are saving your seeds, you’ll notice is a lot of white fluffy materia, called chaff. It’s perfectly fine to plant your seeds with the chaff, but if you’d like to, you can separate the seeds from the chaff. To do this, put the seeds and chaff in a fine mesh strainer and shake over a bowl. The seeds will fall through the strainer and most of the chaff will be left in the strainer. If you’d like to store your seeds for later use, leave them in the paper sack for a few weeks to absorb any moisture. Once your seeds (and chaff) are completely dry, put them in a ziplock bag or airtight container and store in a cool, dry location. Watch the video from my YouTube channel, “How to Save Lettuce Seeds” so you can see exactly how to save lettuce seeds from your garden so you can have FREE seeds for the next time you plant. Comment below – let me know if you are saving lettuce seeds (or any other types of seeds) from your garden! Share with friends, follow me, view how-to videos, photos of my garden, and lots of growing tips and tricks, on YouTube, Instagram, Facebook, and Pinterest. Great information on lettuce seed saving! Loved the Youtube video. I have an organic farm & chickens in my backyard which provides me with food and endless entertainment. My goal is to save seed this year and I had no idea it was so easy. Thank you! So glad you are getting the seed saving bug!! When you save it yourself for the next season it will be adapted to your growing zone and be more productive and hardy! for your support!! My pleasure Yana!!! Thanks for stopping by! !